This morning I found a hotel cardkey from a 2007 con in my stuff. I’d feel guilty, except I know they churn these keys out by the millions, and since the whole thing is computer-controlled, they’ve already invalidated the darn thing. So now it’s a memento. What got me thinking, though, is the memory of when hotels actually handed out metal keys, usually on large plastic keychains with the room number embossed on them. Yes, those were simpler times. Oh, when I say “enter hotel rooms,” I mean one that you or a roommate have paid for. Room parties, rooms that you’re only responsible for as an event organizer, etc. don’t count. Most of the old hotels here in manitou still use keys.
. . . that’s some classy hotels, right there. 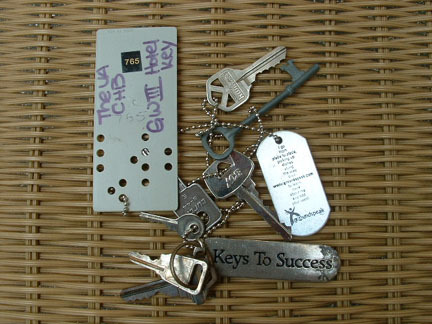 The last time I used a physical key to get into a hotel, it was in Walnut Ridge, Arkansas, and the giant key fob was made of old splintery wood. If a hotel ever asks me for a retinal scan to use to unlock my door I’m staying in another hotel. Fingerprints would be okay, but not a retinal scan. You forgot about the hard plastic hole punch keys! Or, am i the only one that’s used one of those? I used a very large metal key just this pass week in Berkeley Springs, WV. It was a regular sized key as in the part that goes in the lock, but the rest of the key was about the size of a saltine cracker! By the way, did you get my offer on your model kits? I did, but I am behind on my e-mail. I’ll be writing you shortly, but I pretty wanna take you up on it! Key, keycard, staff member, banged on door. I also once climbed in the window, but only after I climbed in the wrong one first. While someone was lying in bed, facing the window. Awake. On the third floor. The name is Bond. James Bond. We have seen somebody attempt to enter a 3rd room party by climbing the balcony simply because the doorway was too crowded. You left off “asked a nearby fan with enough lockpicking that it was faster to get them to open a door than to go check out a legit key”, although the only case I clearly remember myself would have fallen under “rooms responsible for as an event organizer”. Plus, as others have mentioned, mechanical or electro-mechanical keycards.